I admit, this took a while. 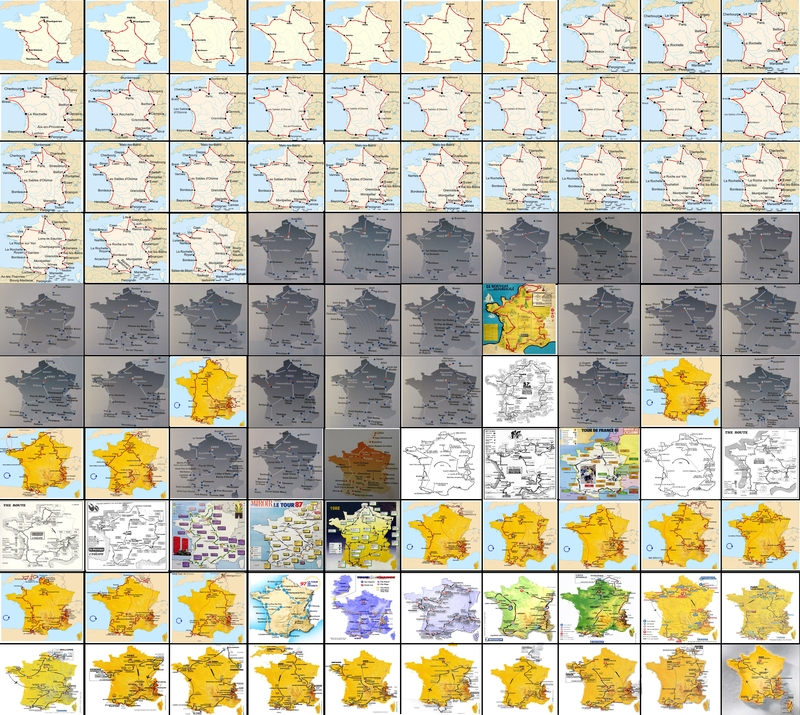 But I’ve complied all 100 routes of the Tour de France from 1903 to 2013 as well as every winner from the same period into two, admittedly quite large, images. I advise you click on them to view them properly and have a better look – they should be large enough to read individually! 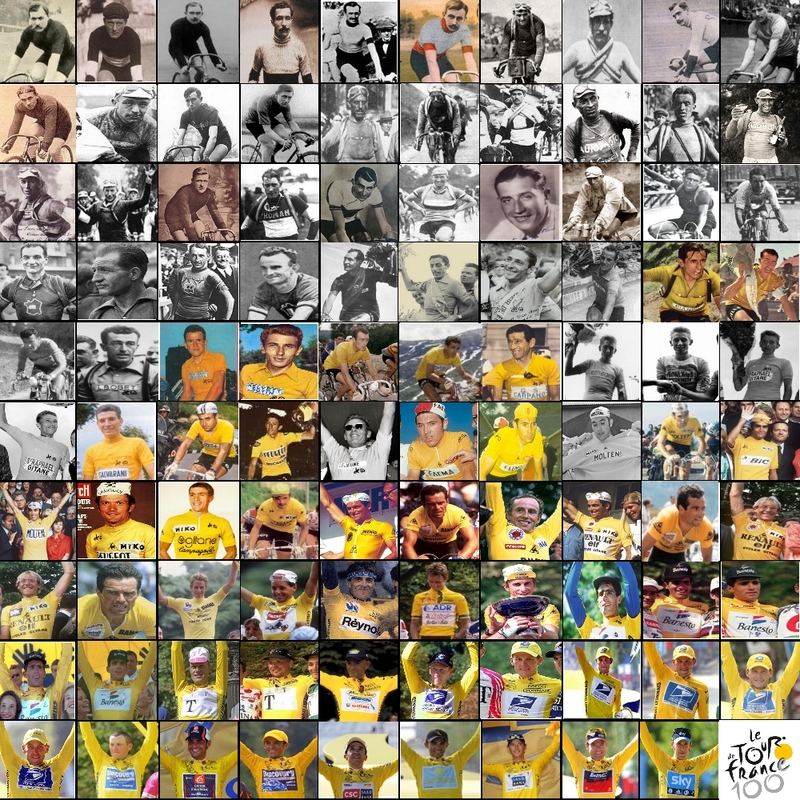 NB: I don’t see the point in all this ‘rewriting history’ nonsense, partly because, as a university historian, you don’t just take out the bits you don’t like, and partly because it needs to be consistent – if you take out Armstrong, then lets take out Garin, Delgado, Anquetil, Riis, Ullrich, Pereiro, Contador, Coppi, Merckx, Fignon, Roche, etc as well, as they’ve all failed tests or cheated (lets be fair to Garin, he took the train ) in some manner, so why not wipe them out as well? I could probably find some heresay for everyone else as well if I wanted, so I’ve left Armstrong in – he won the Tour 7 times. If that’s horrendously offensive, well, tough. It’s sport, I’m sure you’ll live. Great work! I am still waiting for someone who makes in Google Maps a map with all routes 1903-2014. I am curious where the tour never came, in which spots of France. And where it most frequently passed through (I guess Montpellier). Your collections of maps might help with this. When does the Cycling season begin? What do cycling sponsors actually do? Bike company names and Logos - Origins, history, explanation. How strong is this year’s Tour de France field?